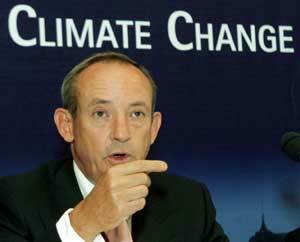 The United Nations General Assembly has proclaimed 21 March the International Day of Forests. The Day will celebrate and raise awareness of the importance of all types of forests. Click here for the full text of the UN Resolution. Today is the first International Day of Forest. “The four “Fs” – food, fodder, fiber and fuel” says the Assistant Director-General of the Food and Agriculture Organization (FAO), “are threatened by climate change and population growth“. Eduardo Rojas-Briales says with the population expected to increase to nine billion by 2050, the underlying worry is the huge tension around land use which will affect the four “Fs”. In this interview with Donn Bobb, Eduardo Rojas Briales first talks about the Day. To celebrate the International Day of Forests, you can share your photos of forests and tree planting initiatives on this web site. Show the world how trees, forests and their surrounding environments make a difference to the community where you live. Above you can submit photos by logging in as a guest. Check the terms and conditions for image specifications. It is not too late to reverse this destructive trend if we act now. Forests still cover more than 30% of all the world’s land and contain more than 60,000 tree species, many still undiscovered. 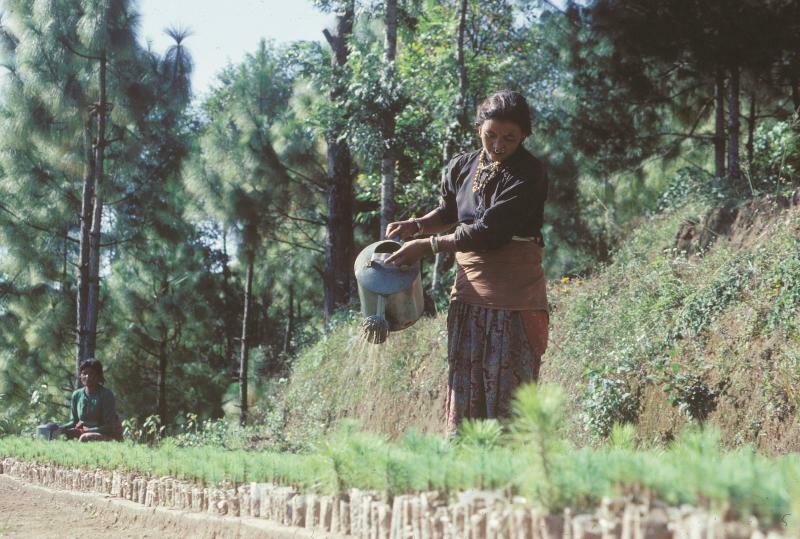 The forests support the livelihoods of 1.6 billion of the world’s poorest people by providing food, fiber, water and medicines, as well as regulating environments. Those supported include indigenous peoples with unique and precious cultures. Forest Day began as a casual conversation in Oxford, England, in February 2007, between two scientists who felt the world was underestimating the importance of forests in mitigating carbon emissions and saw a glaring need for the latest forestry research and thinking to inform global policy makers and UNFCCC negotiators. They did not foresee that the conference would become one of the most influential global events on forests and climate change today. Each Forest Day is convened by Center for International Forestry Research (CIFOR) on behalf of and in close cooperation with its fellow members in the Collaborative Partnership on Forests (CPF). Woodsy Owl and Smokey Bear give each other a fist bump at the International Year of Forests celebration for U.S. Department of Agriculture employees, on Friday, June 3, 2011 in the Patio of the Whitten Building, Washington, DC. The “Celebrate Forests. Celebrate Life.” campaign is the official U.S. celebration. Coordinated by the National Association of State Foresters in partnership with the U.S. Forest Service, the U.S. celebration aims to elevate awareness and understanding of the value of America’s forests and showcase the connections between healthy forests, people, ecosystems and economies. The goal is to provide all forestry stakeholders with ideas and resources to participate in the celebration over the year. 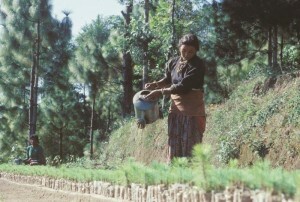 On 9 February 2011, Deputy Director-General of Food and Agriculture Organization of the United Nations, Ann Tutwiler, and Assistant Director-General of the Forestry Department, Eduardo Rojas-Briales, launch the 2011 edition of the FAO flagship publication State of the World’s Forests (SOFO). The State of the World’s Forests reports on the global status of forests, recent major policy and institutional developments and key issues concerning the forest sector. 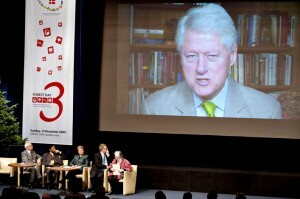 On May 5, 2011, at the Romanian Academy has been a national debate regarding the “2011- The International Year of Forests”. On July 15, 2011, in honor of International Year of Forests The New York State Department of Environmental Conservation (DEC) Division of Lands and Forests kicked off the Celebrating New York’s Forests Photo Contest. This contest is an effort to increase awareness of and appreciation for all types of forests, urban and rural, large and small, public and privately owned, across the state. The inaugural Forest Day was one of the major events at United Nations Framework Convention on Climate Change (UNFCCC) Conference of the Parties (COP) 13 in Bali, Indonesia on 7 December 2007. 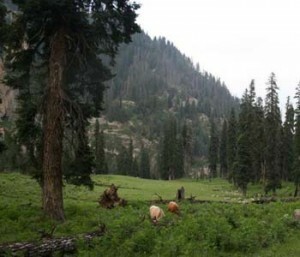 More than 800 people participated in Forest Day, including scientists, members of national delegations, and representatives from intergovernmental and non-governmental organizations. Sub-plenary 1, organized by IUFRO, CIFOR, ICRAF and PROFOR-World Bank, discussed the cross-cutting theme “adaptation of forests to climate change.” Panelists included (L-R): Bruno Locatelli, CIFOR; Gerhard Dieterle, World Bank; Markku Kanninen, CIFOR; Balgis Osman-Elasha, IUFRO; and Dennis Garrity, World Agroforestry Center (ICRAF). Building on the positive response to the first Forest Day held in Bali, Indonesia, Forest Day 2 brought together nearly 900 participants to discuss the opportunities and challenges of bringing forests into global and national strategies for climate change adaptation and mitigation. Frances Seymour, Director General of CIFOR delivered a summary of Forest Day 2 to Yvo de Boer, Executive Secretary of the UNFCCC. This summary was drafted by a committee representing members of the CPF, and included points of consensus as well as points of disagreement that emerged during the course of the day. Recognize and respect the rights of women, poor people and Indigenous Peoples. Former U.S. President Bill Clinton addresses a gathering via video link from New York as delegates look on during Forest Day 3 in the Falconer Convention Center in Copenhagen. Moreover, one of the indicators of the relevance of Forest Day – its ability to attract world leaders – became clear at Copenhagen. The theme for Forest Day 4 was “Time to Act,” highlighting the urgency of ensuring the survival of the world’s forests, the biodiversity they embrace and the hundreds of millions of people who depend on them. 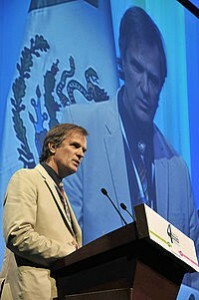 The event served as a bridge between the International Year of Biodiversity and the 2011 International Year of Forests. Forest Day 4 was hosted by the Government of Mexico, through the National Forestry Commission (CONAFOR), CPF and CIFOR. Keynote speeches by Daniel Nepstad, Director of the International Program at the Amazon Environmental Research Institute and Mirna Cunningham Kain, Chair of the Center for Autonomy and Development of Indigenous Peoples, emphasized the critical needs for both sound forestry and climate change science, and pro-active engagement with indigenous people and forest-dependent communities as the de facto and de jure custodians of land and forest resources to secure equitable outcomes. UN Under Secretary-General for Economic and Social Affairs Sha Zukang provided an important forward-looking perspective, drawing participants’ attention to the multiple benefits of forests and the International Year of Forests in 2011. Harnessing REDD+ to sustainably manage forests and reduce poverty: The day saw the emergence of a robust consensus that the risks of no action on protecting the world’s forests are far greater than the risks of moving ahead with less-than-perfect agreements. Strengthen linkages between national and subnational MRV systems for REDD+: Challenges remain for monitoring forest degradation and peatland emissions but these may be overcome with significant additional capacity building and technology transfer, including the application of novel technologies. Examples include Google’s Earth Engine (demonstrated by Rebecca Moore, Head of Google’s Global Outreach Program prior to the Closing Plenary of FD4), Open Data Kit and androids for forest biomass measurements with communities. The theme for Forest Day 5 was ‘From Policy to Practice’, aiming to inform the COP agenda and forest stakeholders on ways to implement the REDD+ agreement reached in Cancún in 2010 to produce social and environmental benefits, and to integrate forests into adaptation strategies on the ground. Organizers gave special attention to issues relevant to sub-Saharan Africa, to REDD+ issues facing the humid tropical forests of the Congo Basin, and to the improved management and use of Africa’s dry forests areas. 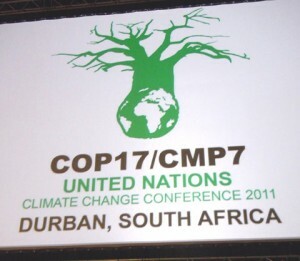 The 2012 COP 18 is to be hosted by Doha, Qatar from 26 November to 7 December 2012. Forest Day 6 will take place on the sidelines of COP 18 on 2 December 2012, and will consider issues ranging from REDD+ financing to adaptation, desertification, reforestation and afforestation. Oscar-winning film-maker Nick Park, the magic behind Wallace & Gromit and Chicken Run, invites you to share your forest story and submit your short film to the International Forest Film Festival. In this video, Nick talks about his childhood imaginations and personal love of forests. To take part in the International Forest Film Festival, your submission can be up to 2 minutes long, about your own relationship to the forest. For more details, please visit HERE. collection of forest resource statistics aimed at improving the country capacity for planning and policy development (National Forest Monitoring and Assessment). We’ve also developed posters and web banners using the International Day of Forests logo for your use. And feel free to share the video and spread the message. The Great big forest have be stripped from most of the Earth for Greed of Money by the Wicked. The trees are our Main Source of Oxygen on this Planet Earth. The Forest Trees do more than just make Oxygen they stop Soil Erosion, just Look at the 1930 Dust Bowl. Greed by our Government taxes led farmers to clear cut all their Forest and farm all the land they were being Tax on. They had to farm it to pay for the Taxes. Why leave the Trees when food crop makes Money. This Did not Help the Depression that effected most all Worldwide. This year 2013 more than 100 million will suffer from Malnutrition lack of food and Dehydration lack of water. Many will not make it and die! as have in the last few years. Soon many will run out of Safe Drinking Water from pollution going into the worlds water supply. The rise in food prices will be global. In the United States of America alone more than 46+ Million Americans Received Food Stamps and that number is going up every day every year for more than 5 years in a row now. Soon the Sun’s Solar Wind and UV rays will be way to strong for most to go out in the Sun Light for even a short time. The Geomagnetic Storm to come and the Bad Weather Storms well you have not seen nothing yet and the Sea Level is Rising the Oceans. The Sun Rays is leading to the Drying of Fresh Drinking Water. Many Lakes World Wide have set records for all time Low Water Level. Many Millions have been affected by Floods in China and Pakistan just last year. In 2005 Over a Thousand dead in New Orleans flood, and the list going on. The sounds and rumbling of Volcanoes and Earthquakes Around Earth are Waking Up at a Alarming rate. FOR A SHORT TIME ALL THE MILITARY ON ALL SIDES PUT DOWN THEIR WEAPONS AND PLANTED TREES IN PAKISTAN MORE THEN A MILLION TREES IN A DAY AND THEY DID THIS FOR MORE THEN A DAY. NOW WHY CAN WE NOT DO THIS WORLD WIDE? He won the Nobel Prize for this.